Dr. George Elliott Clarke told students at the final Foundation Year Program (FYP) lecture of the year that throughout their lives they would be faced with moral and ethical questions they may not even be able to conceive of now, but assured them they would be equipped to confront them when the time came. In his guest lecture called, “Now that you have the foundation, what do you intend to build (intellectually)?”, Clarke implored those gathered to use the FYP model of learning as a model for approaching life, by journeying through history to better understand and make decisions in the present. Clarke, a renowned poet, playwright, novelist, professor, social activist and public intellectual, offered two examples to illustrate his point about history revealing the answers to problems in the present. The first example was the Trans Mountain Pipeline, which will carry crude and refined oil from Alberta to the coast of British Columbia pending federal government approval. When Pierre Elliott Trudeau was considering approving the Mackenzie Valley Pipeline in 1974 while he was prime minister, Clark recounted that he [Trudeau] decided to consult with Canadians, including Indigenous peoples. He started the Berger Commission to investigate the social, environmental, and economic impact of the proposed gas pipeline that would run through the Yukon and the Mackenzie River Valley of the Northwest Territories. The commission recommended that no pipeline should be built. “A report was tabled that said ‘no pipeline should be built’ and it was not. I was waiting for a journalist to reference this recent history when Canada got a progressive answer. Someone had to do some homework. Dust off some Hansard’s. See what the past taught us,” Clarke said. “Their failure to follow up responsibly meant fake news could exist. Failure to hold governments to account made it possible for someone like Trump to come along a few years later and say, ‘You can’t trust the news media.’ As a socialist I had to concede that the right had a point,” Clarke said. Clarke shared his own life story of being into poverty in Windsor, N.S., and raised in Halifax. He said he remembers being in classrooms in which black kids were streamed. When he was in grade seven at Bloomfield School, he was one of the children issued a Social Insurance Number so they’d be ready to quit school and enter the work force. He stressed that every job is dignified but said the system undereducated some citizens so they could be exploited as cheap labour. Of the approximately 150 students from Bloomfield School that resisted dropping out to work and went on to Queen Elizabeth High School, only 10 graduated on time and only three graduated with university preparatory courses, Clarke said. He was among the three. “I was one of the lucky ones,” he said. He credited his earliest teachers, including [former leader of Canada’s New Democratic Party] Alexa McDonough, librarians at the Halifax North Memorial Library, and later in his life social activists Burnley [Rocky] and Joan Jones, and fellow poets including King’s Journalism Professor Sylvia Hamilton, for encouraging his poetry and thought. “Be a public intellectual. You are a threat to the state. You might as well just own it,” he implored them. King’s is grateful to George Elliott Clarke for delivering the final Foundation Year Program lecture of the 2018/19 academic year. 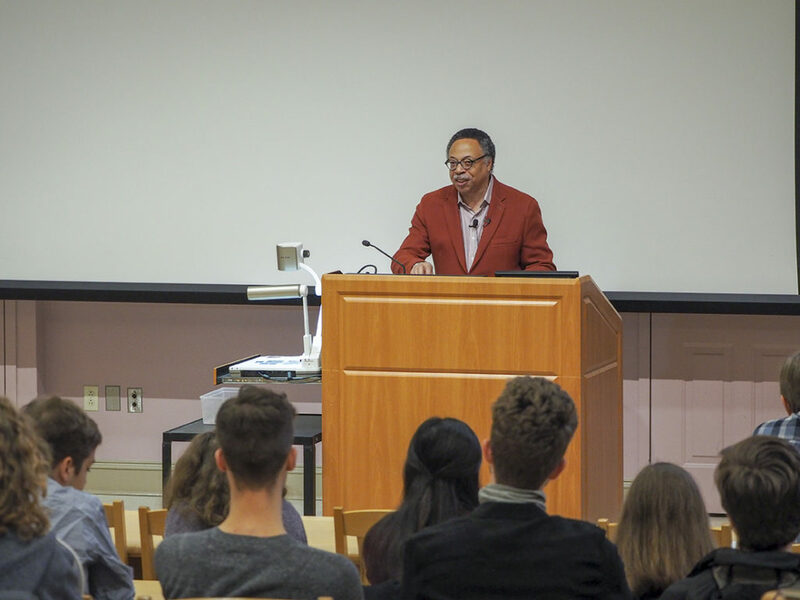 WATCH: Dr. George Elliott Clarke recites “The Peacock’s Throne” at the Final FYP lecture. Yet who can fence in majesty? Who can imprison a cathedral? Who can lock up dream? What bureaucrat can cage the sun?